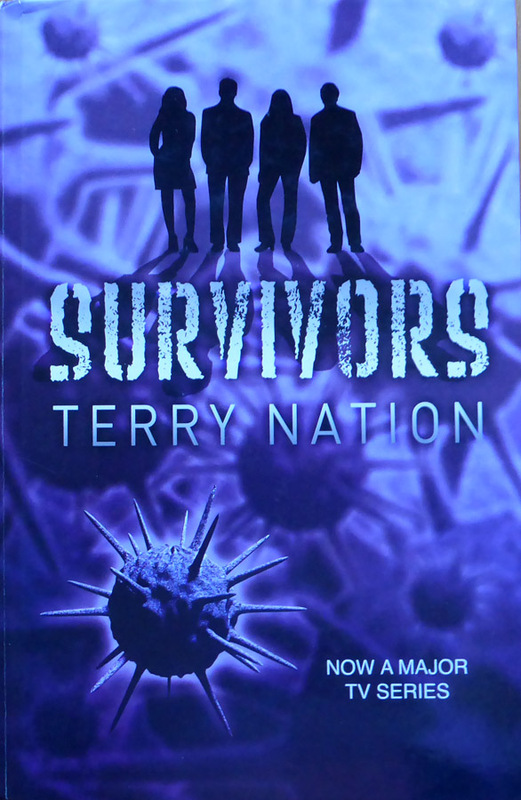 SURVIVORS – by Terry Nation, a reviewette of the 1976 BOOK – The Diesel-Electric Elephant Company. Survivors – do you remember making absolutely certain that everything was ready for you to be able to watch the next episode of this nineteen-seventies television series? Do you remember wishing that someone had invented the affordable, domestic video recorder earlier than they would do, some years hence? Do you remember the opening titles, with the fumbling, masked “scientist” dropping a flask of milky nonsense? The eerie music? The storyline is – and was then – about as old as the hills, but there was a magic about the series that drew me in. I have the whole series on DVD and drag it out every few years for a Survivors-fest, and I know that I am not alone in doing so. Yes indeed, it looks dated now and very “seventies”, but all of the old magic is still there. Better yet, there’s not a single zombie, not a whiff of the walking, dead or otherwise. It’s all set in England, with English characters, English accents and, at the risk of using the word “English” too much (is that even possible? ), English thinking, dialogue and action. Well, I did eventually think of it, and I went out and found a copy. Notable Benny – do not confuse the 1970s television original with the rather dismal 2008 “remake” effort, written for the screen by Adrian Hodges. This “updated” version strangled itself in political correctness and “action”, introducing us to a veritable rainbow of required characters from the “racial” and “social” “diversity” bucket. The BBC say that they axed it after just two poorly-received series. I say that it took shame and hanged itself. A conundrum. A conundrum is a bit like a kettle drum, except that you don’t put it under your chin to play it. The problem – the series, and the setting and action of the book, is yer genuine stiff upper lip, cup of tea and what’s the weather going to be like today, dear, and yet the secondhand library copy that I copped off Amazon for a couple of quid is written in American. Now, dearest USA-ist American friends, please, please, please don’t take offence (“offense”), but American is not English and English is not American. The two languages, after all these years apart, have a different syntax, different spelling and, most importantly of all, different flow and different thinking. Doubtless you chaps from across the pond notice the same jarring effect of bumbling along for a dozen words only to find a letter “c” where a letter “s” should be or verse vica, a “u” where you didn’t expect one or a lack of a “u” where there ought to be one, an “oriented” where one had expected to be “orientated”, “gasoline” for “petrol”, “sidewalk” for “pavement” – the list isn’t endless, but it is a ruddy long list! Imagine, if you will, reading Shakespeare in the original Bulgarian, or Chaucer in his native Tagalog. Mind you, Terry Nation was born in Cardiff and ended his days in Los Angeles, so the strangeness of the mix is not wholly unexpected. Usually I can’t read past the first chapter if I am being written at in foreign [insert smiley “emoticon”] but the magic of the original television series was such that I persisted. It made me grind my teeth, it made my ankles ache and I had to release the occasional fruity expostulation, but persist I did. I am glad that I did. The plot gave me a familiar hug in the way that a psychiatric nurse from one of my earlier institutional periods might hug me should we meet in a court waiting room or drugs-test clinic foyer today. The television series made a couple of giant leaps separately from the book and the book made one huge, monumental, vast, gob-smacking leap-and-omission with the ending. In dance terms, these two formats are just a jump to the left, and then a step to the ri-i-i-i-ight apart. So similar, so very different. The ending of the book is and may only be described as PHENOMENAL. Clip the pages together, seal them up somehow, but DO NOT LET YOURSELF GLANCE AT THE ENDING BEFORE YOU HAVE WORKED YOUR WAY THERE. I promise you, the ending is worth it. Anyone who watched the series in such thrall will be left by the book in a state of shock. The ending in the book is nothing like the ending of the television series. I damned near fell off my horse when I read it. In fact, had I not been riding a very short Shetland around my library that day then I may well have actually taken a tumble into the Axminster. It’s a simple plot, in the book. You need, I think, to have lived through the television series and re-lived it in excited discussions in order to give the book body and substance. Mr Nation was no fool, he knew that he was writing for the small screen and not for the library. That said, they go together like twin-set and pearls, like Ovaltine and bananas, like happy dogs and fleas. Five stars, in spite of being written in “New Worldese”? Oh yes. Yes indeed. Five stars, in spite of the geek-disappointing detail? Good gracious me, yes. If Mr Nation had his characters sit in an E-Type Jaguar, a Ford Granada or a Range Rover once and “press the starter” then he had them do so seven times seventy times. No, no, no, no, no – starter buttons went out in the automotive fifties and only came back into vogue in the inspirationally-bankrupt noughties. The drinks are wrong, for England, and a dozen other little details irk and irritate. There isn’t a gin in there, it’s all “whiskey” with the extra (Irish product) “e”. Mind you, it’s not all discomforting niggles, oh by no means so. The book cleared up one enormous mystery contained in the television series – Greg. Mr “I’m an engineer” Greg Preston. On screen he was a pillock, a wuss, a half-wit who wouldn’t know one end of a spanner from another (spanner – “monkey-wrench” – which I hitherto had thought was a wrestling move favoured among apes, not a mechanical tool). This is explained almost incidentally in the book, and the poor actor, Ian McCulloch, whom we all wrote off as an awful thespian was in fact playing the part of Greg as defined by Nation in the book to the Nth most accurate degree! I recommend two things to you all, my lovelies. Three things, I recommend three things to you all my lovelies, yes indeed (I think I am chanelling Terry and having a spot of the Welsh). Three things. Buy the original series on DVD and watch it all in one fell swoop. Buy this book and read it all ditto. Lobby whatever your equivalent of a Member of Parliament is to have your “New World” language renamed to prevent my squirming as I stumble through texts that were advertised in all ways as being written in my “Old World” language! Now I shall have to drag the DVDs out again. Once more unto the Cardinal’s modest cinema, dear boy, once more, and let us not spare the Kia-Ora or the small tubs of delicious ice-cream with the little wooden paddles. Sodbucket? Lower the lights and tell the projectionist that he may begin. I had a brief spell during my own childhood of schools where “expression” was more important than reading, writing and ‘rithmatic – I spent so long being a tree and getting in touch with my feelings at some that I was glad when we moved home again to other areas! Give me a school where I need to know that two plus two make four and only four, any day! Corporations the instruments of the damage – buying in television as though it’s all interchangeable, trying to save money on common advertisements and wotnot. It’s all very depressing in terms of speak-a-da-lingo (and write-a-da-lingo too)! 😉 It’ll end in the human species going back to animal grunts and the baring of teeth for communication.